Several items are set on sale around Baldur's Gate and beyond. 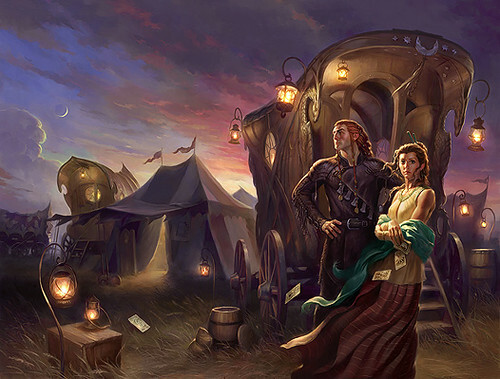 The caravan shop recites as "Bethany's Treasures - Golden Wheel". On the wagon there are rare and common items for sale. 70 trade bars. An amulet of Will +3 is given for free with this item! WANDS ARE ALSO AVAILABLE ON REQUEST. Last edited by Deragnost on Mon Mar 04, 2019 12:07 pm, edited 9 times in total. Mel Darenda walks by, pausing by the wagon. He approaches it, and with a cheeky smile says: "I've come to buy the greatest treasure here." After a bit of haggle, the tiefling accepts his bid for the "greatest treasure there". Just this once. The Amnian is pleased with the deal, so impedes the wheels of business no further! ///The list of items available has been updated. An easterling garbed in monastic robes emblazoned with the holy symbol of the Firelord offers the buyout sum for the Cloak of Displacement. The tiefling accepts the offer with a smile, and gives the cloak to the man. The list of the items available gets updated once more.